I joined Daring Bakers. 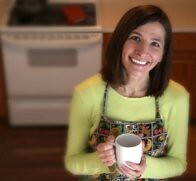 If you haven’t heard of Daring Bakers, it’s an online baking club where the members bake a new recipe each month. This month is baklava. I made mine with candied fruit and toasted nuts, similar to a fruitcake — and I learned you have to be a bit of a fruitcake to make baklava from scratch. This is my third attempt at working with phyllo dough. The first time, I made spanakopita. Tyler Florence made it look easy on Food Network. 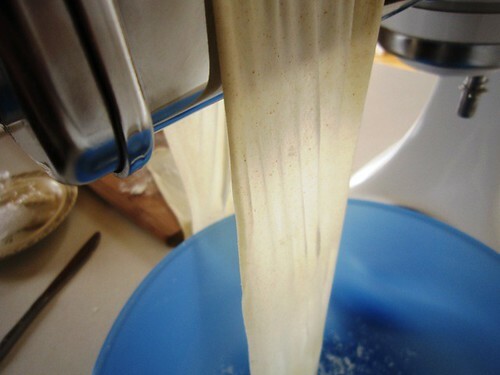 I quickly learned it is not easy, and you can’t fast-forward through the slow, tedious process of layering the dough. It took hours to make, and only seconds to eat. I decided it was not worth the effort, and I never made spanakopita again. A couple of years later, I made baklava. It was an assignment in a cooking class I took with my mother-in-law. 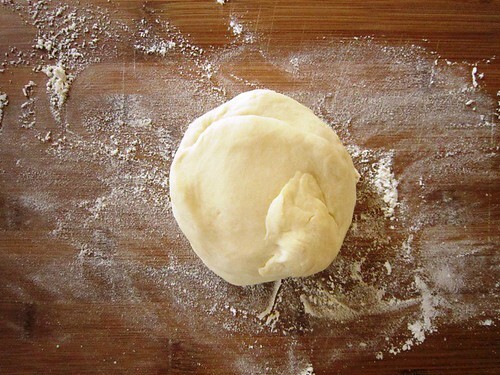 Fortunately, we were able to use store-bought dough. However, I still thought it was way too much work. 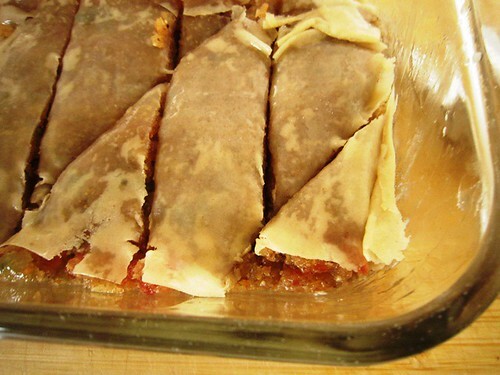 Now with this Daring Bakers challenge, I made baklava again — and phyllo dough from scratch. To make matters more challenging, I procrastinated until the last minute to make it. Without much time to spare before my baklava post was due and given my previous experience with phyllo dough, Ken suggested I join “Lazy Bakers” instead. Given how my baklava turned out for the challenge, it might not be a bad idea. The humidity was 90 percent the day I made it, turning my baklava into bakla-blah! After my baklava disaster, Ken said I should have done a practice run first. Silly Ken. Practice runs are for wimpy bakers, not for daring bakers — or for bakers who are crazy and lazy. In all honesty, Ken was probably right. I think the moral of the story is “don’t procrastinate.” Allow enough time to practice first when trying something new. One good thing about this baklava is the filling. 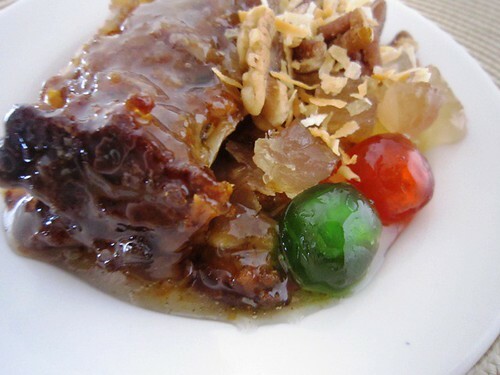 It is packed with toasted nuts, coconut and candied fruit — just like fruitcake. For the dough and syrup, I used the recipes provided by Daring Bakers for the challenge. 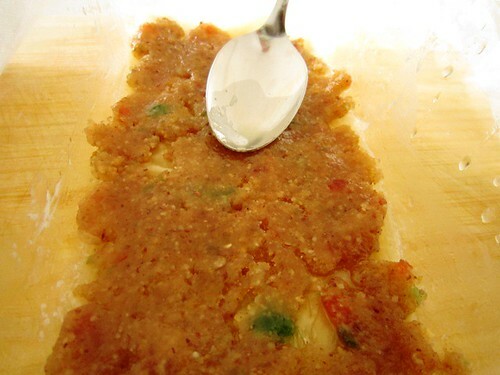 For the filling, I improvised using a combination of nuts and fruit inspired by my desire to make fruitcake. Disclaimer: You may not want to make this exactly the same way I did. 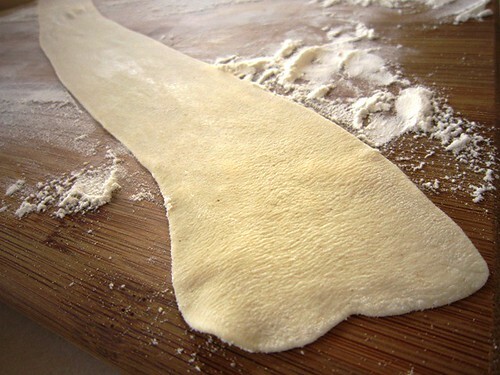 You can see where it all starts to go wrong after rolling the phyllo dough. 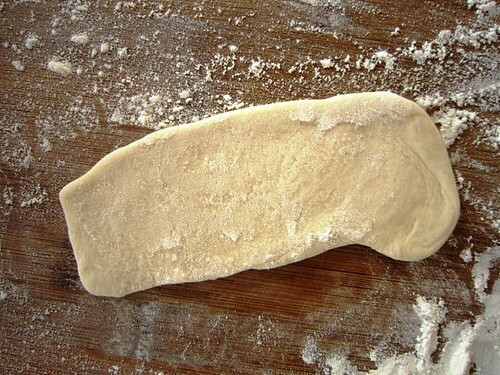 I started by making the dough. 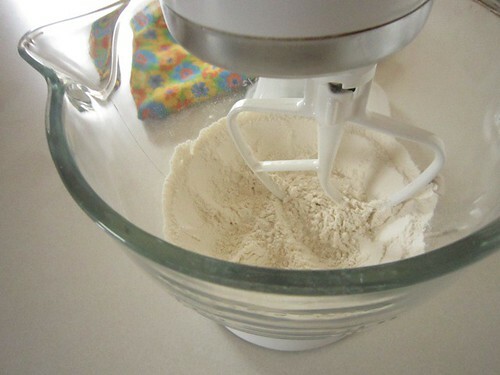 In my stand mixer, I combined the flour and salt. 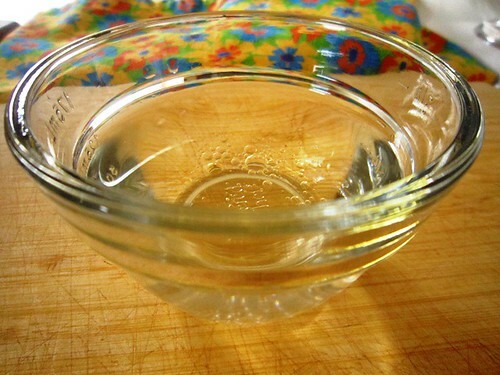 In another bowl, I mixed the water, oil and vinegar. 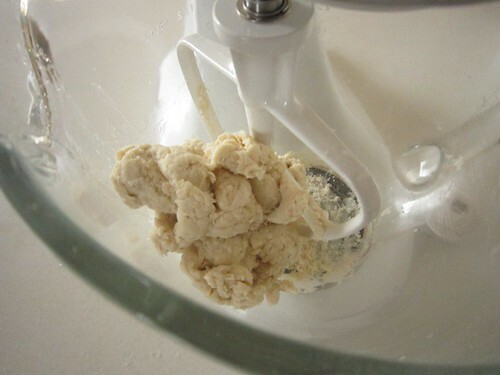 I added the wet ingredients to the dry, and mixed until a dough formed. 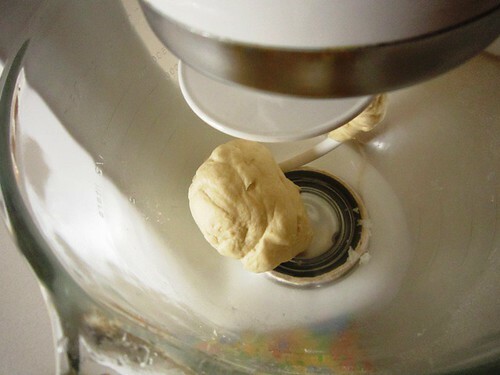 Then I used my dough hook to knead the dough for 10 minutes. 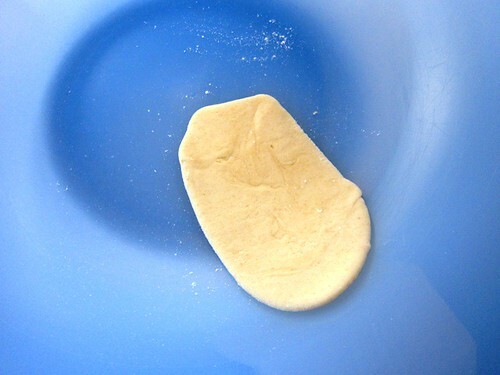 I kneaded the dough by hand for two more minutes. I shaped the dough into a nice little ball. 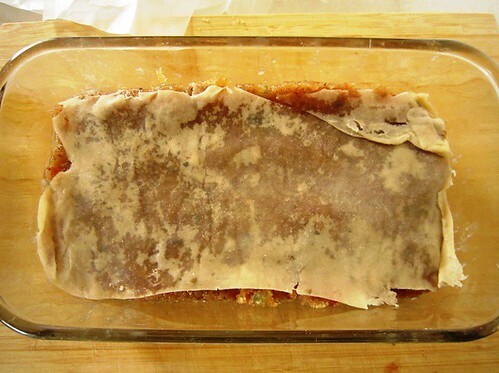 Next, I wrapped it in saran wrap and let it rest for two hours. Meanwhile, I made the fruitcake filling. I started by trying to grind a cinnamon stick in my food processor. I discovered a coffee grinder works better. 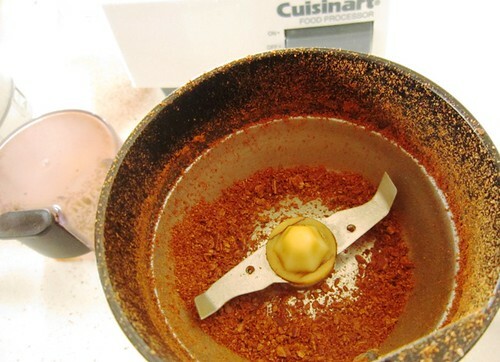 In my food processor, I placed the ground cinnamon, a pinch of nutmeg, sugar, walnuts, pecans and coconut. 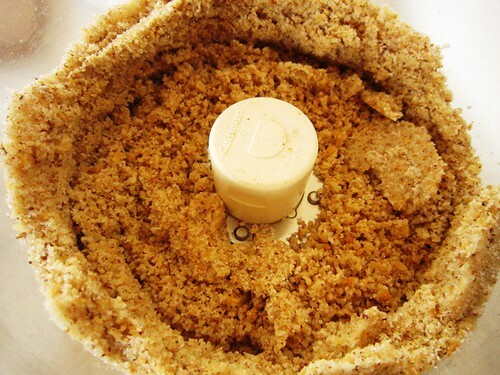 I ran the food processor until all was finely ground. Then I added candied cherries, pineapples, citron and orange peel. 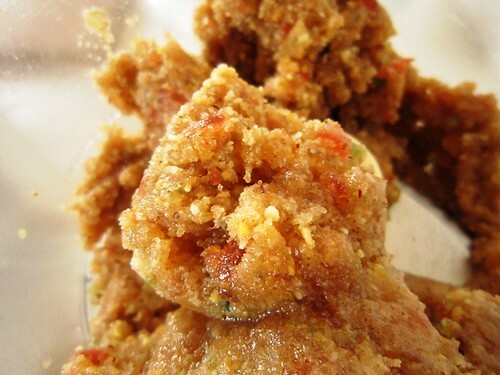 I ran the food processor again until the fruit was coarsely chopped. 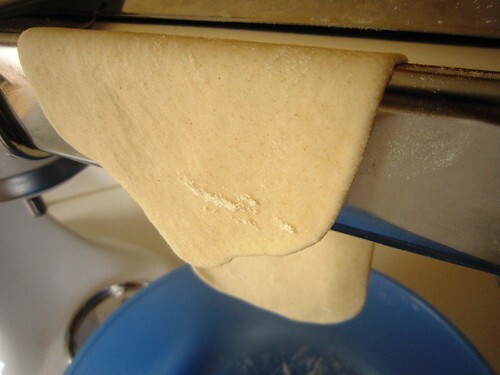 Then I started rolling the dough using the pasta roller attachment for my stand mixer. It was a lot like making pasta. Here’s what it looked like after a pass through the first setting. After a pass on the second setting, it looked like this. It started getting longer after the third pass. After the fourth pass, it was almost longer than the cutting board. At the fifth pass, it was super long. By the sixth pass, it was so thin it was nearly transparent. With the seventh pass, it was even thinner. At the eighth and final pass, it was like paper. As I rolled the dough, I cut the sheets to fit my loaf pan. Here’s where it started to go wrong. I floured each sheet and stacked them between pieces of wax paper. 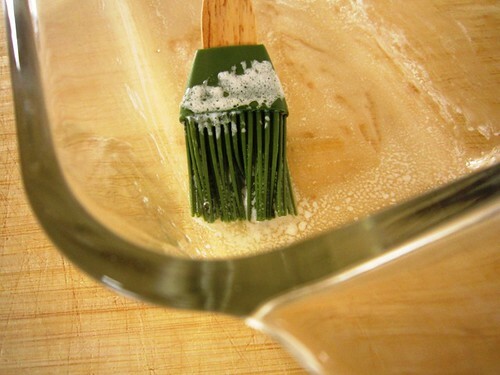 Then I set them aside while I buttered my baking dish. I placed the first dough sheet in the pan. I buttered and layered a few more sheets and sprinkled 1/3 cup of filling on top. Using a buttered spoon, I smoothed the filling in place. As I reached for the next layer of phyllo, I realized something was horribly wrong. The humidity caught up with me, and the phyllo stuck to the wax paper like glue. 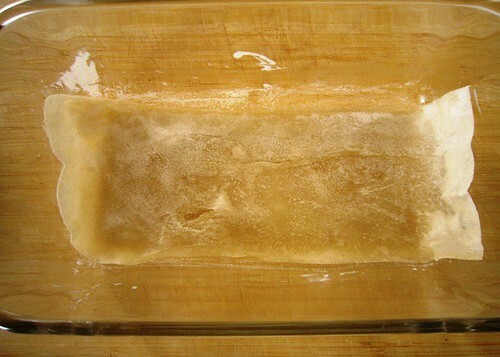 As a result, the next layer looked like this. I patched together as much dough as I could to make the remaining layers, and I salvaged a single piece of dough for the top. I hastily cut the baklava into pieces and popped it in the oven for an hour. By then it was getting late and I was tired. After it finished baking, I left it out to cool while we went out to dinner. By the time I got home to make the syrup, it was dark. That is why my syrup photo looks like this. I poured the syrup over the baklava. This is what it looked like when I went to bed. The next morning, it did not look much better. I scooped out what I could. 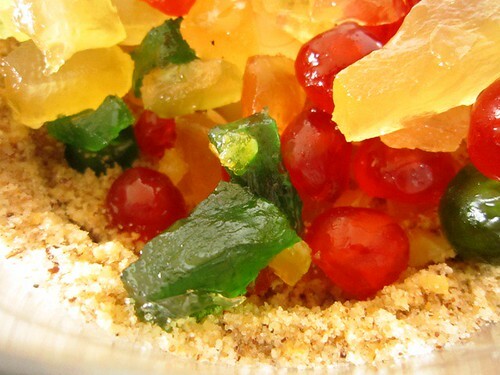 Then I garnished it with a little coconut and extra candied fruit. It actually didn’t taste too bad. It was just super sweet with all the honey. For the phyllo dough, I used the recipe provided by the challenge and adapted from the book Kaffeehaus by Rick Rodgers. For the syrup, I used a baklava recipe by Alton Brown. 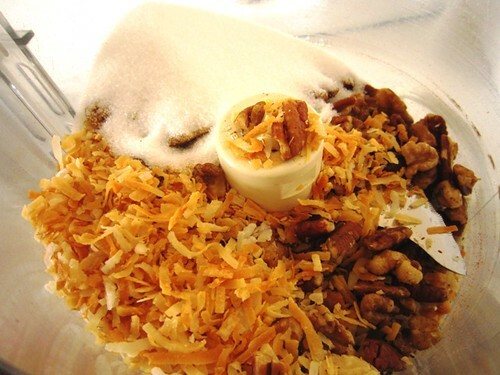 Instructions for the filling: Grind the spices, nuts and coconut in a food processor until finely ground. 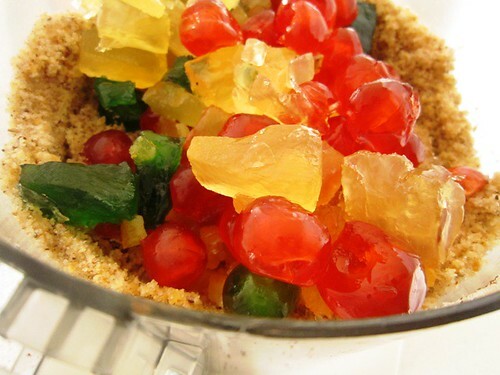 Add the candied fruit, and grind until the fruit is coarsely chopped. 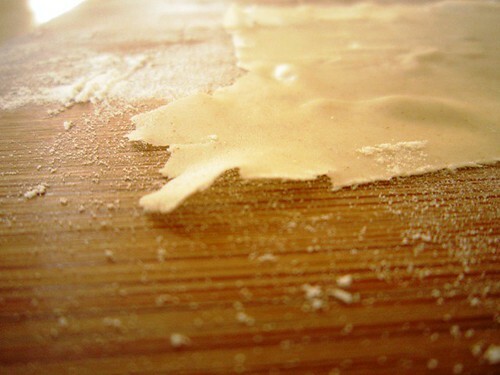 About the dough: Do not layer the sheets of dough in between sheets of wax paper, especially on a humid day. The humidity in the air makes a BIG difference. 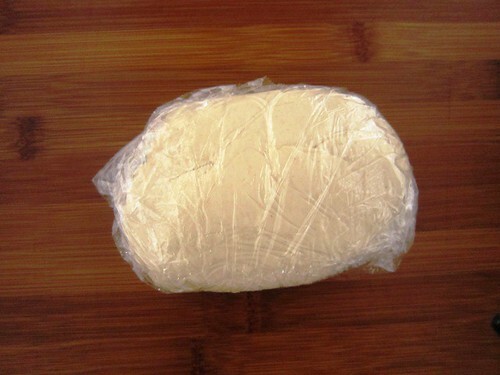 The wax paper captures the humidity and turns the dough into a big sticky mess. 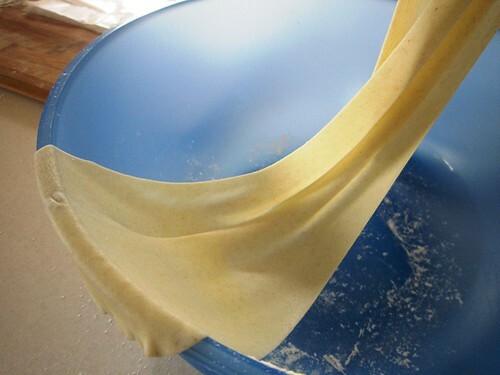 Next time, I might try hanging the sheets to dry like pasta or just begin buttering and layering them in the pan as soon as they are rolled and cut. 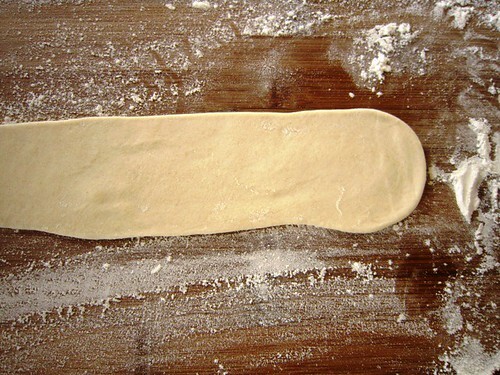 About the filling: Do not over bake it. It probably does not need to bake the entire hour. I baked mine the full time and it was over done. 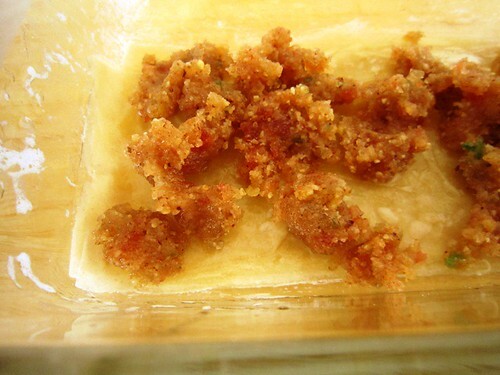 About the syrup: Do not pour hot syrup on a cooled baklava. 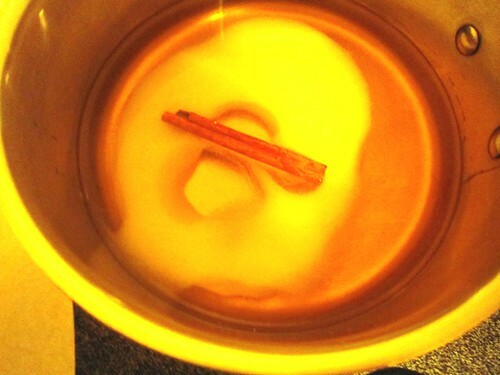 Erica advised making the syrup first, letting it cool and then pouring the cool syrup over hot baklava. I did the exact opposite. 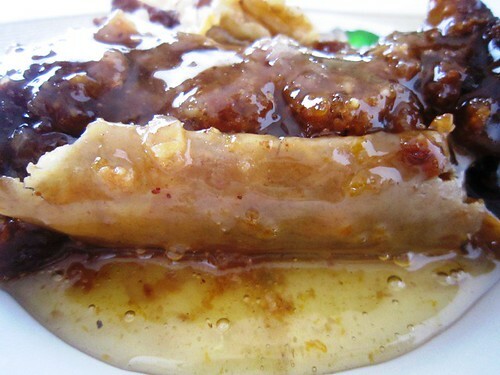 I poured hot syrup over a cold baklava. I am not sure if that is why my syrup never soaked into the cake — or if it was because I had a lot less phyllo dough to absorb it. 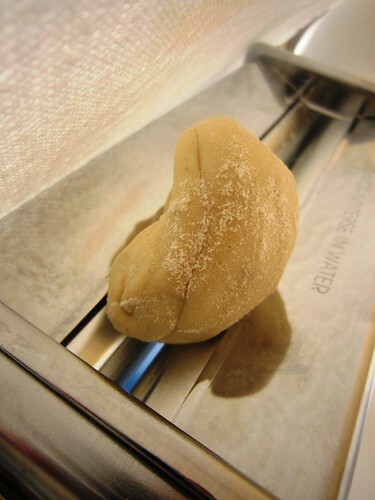 What’s the most daring thing you’ve ever baked? 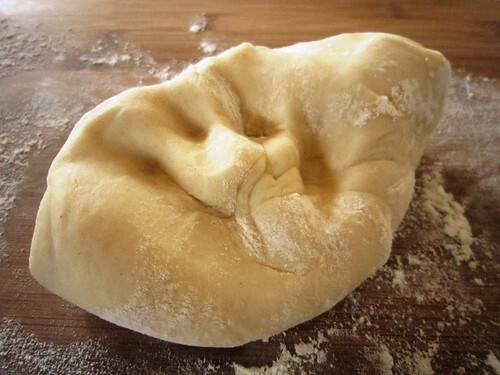 I had sticky dough as well, I thought it was too much water initially, but now that i think about it, the humidity here likely didn’t help either! I do love the look of your layers and the filling in your last photo, nice flaky layers and a decadent looking filling. 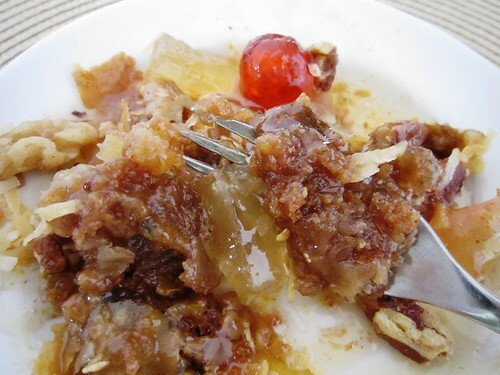 The filling was pretty rich, especially once I added all that honey. Your pecan pie variation looks amazing – especially with that brown sugar and bourbon syrup! Yum! I am so impressed you were able to complete your baklava in the middle of a home renovation project too. Your cast is truly amazing…. Thanks! The candied fruit filling helped to compensate for the phyllo dough mishap. 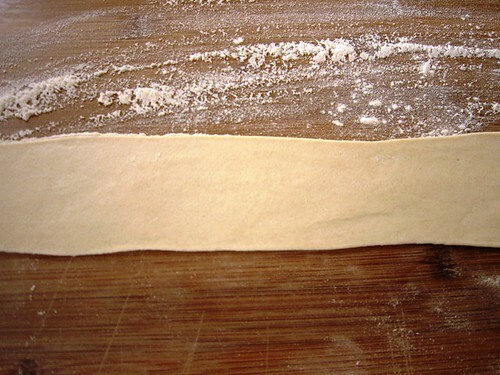 I am extremely impressed you rolled your dough with a rolling pin! It looks beautiful and flaky like a phyllo crust should. Sorry you had such trouble! Humidity is really a killer. Did not even think about that possibly being a reason that the syrup didn’t get all soaked up. Hmmmm…glad that you were able to enjoy your final product even if it didn’t come together as easily as you expected! The humidity definitely added to the challenge. I think next time I would reduce the syrup too. Yours looked like it had just the right amount of syrup. 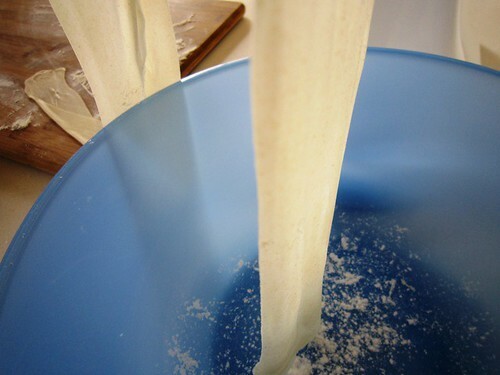 Looks like we had some similar problems – I rolled out all my sheets, stacked them, then took a break for dinner – big mistake – I ended up with one big, thick layer of dough (from 18 separate sheets!). 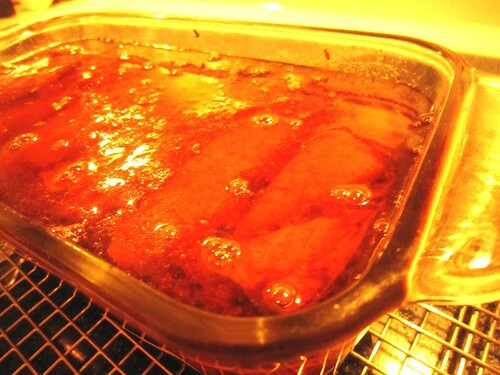 I also wound up with my Baklava swimming in syrup. It was only after the fact that I checked Alton Brown’s original recipe for the syrup in the challenge – that amount was for a 9×13 pan, and I made a 9×9. I ended up tilting the pan for about 90 minutes and removing over a cup of excess syrup. In the end, it was very good, but if I make it again, I will change a few things. Your baklava looks great! We did have very similar problems. I loved your post and laughed out loud at the part about phyllo sticking to absolutely everything. That is so true! 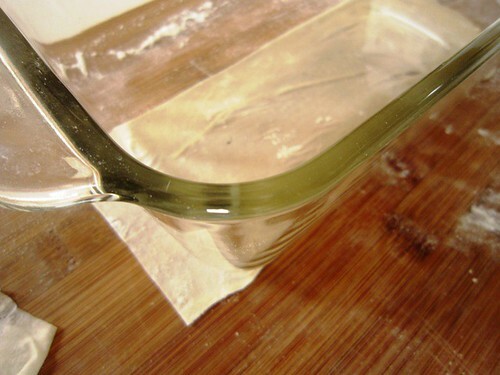 I began to wonder if I had made Elmer’s glue by mistake. I also didn’t realize the amount of syrup from the recipe was for a 9×13 pan. 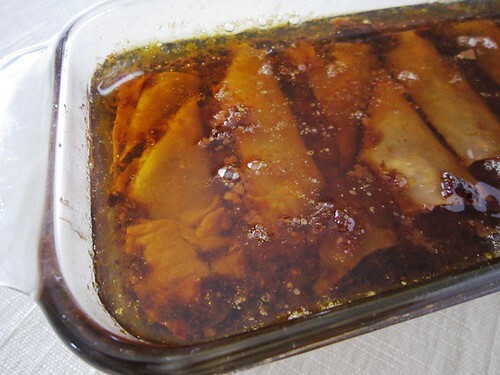 No wonder why my baklava is drowning in so much syrup. I made it in an 8×5 loaf pan. 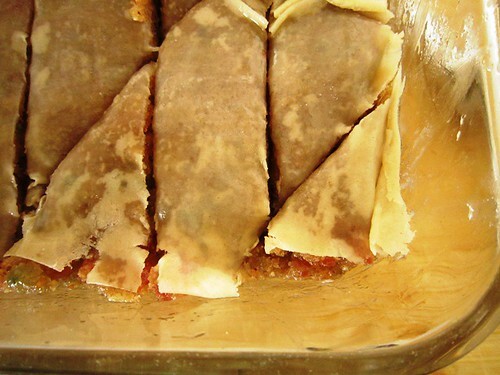 I’ll be changing a lot of things with this recipe too, if I ever try baklava again. Your baklava sounds great, and looks good, too, even if a little on the sticky side! But that is the great thing about the Daring Bakers – even if something doesn’t turn out 100% perfect, you still learned something, and it still TASTES good! Great job! Thanks so much for the warm welcome! In spite of a few of my mishaps with this recipe, I did have a lot of fun trying something new – and in the end it made for a fun story. I’ve been reading about Daring Bakers for a while now, and am so glad I finally joined. Can’t wait to see what we bake up next month. Thanks for hosting the challenge. It’s always fun to learn to make something new. I definitely learned a lot about baklava and making phyllo dough. 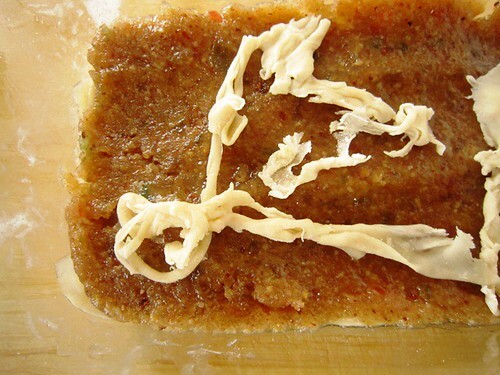 Next time maybe I can get the “va” back in baklava based on what I learned through the process. Welcome to daring bakers family..
You were definitely not alone. Yours looked like it turned out wonderful in the end though. I am still so impressed you made the dough twice. Thanks so much for the welcome to Daring Bakers.